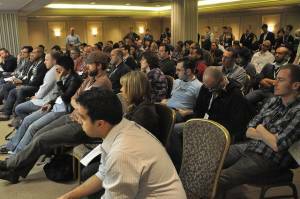 I spent a good portion of Monday at the latest edition of the SF Music Tech Summit. My name tag this time said “SF Weekly” instead of “Deciphering Culture” (I asked for dual identification) so a lot of people buttonholed me to get coverage for a new service. Not surprisingly, most of them fell into the “recommendation and discovery” segment although none of the pitches left me convinced of the efficacy of any of the new spins on the work of the established players. Also, not surprisingly my blog post for SF Weekly’s All Shook Down blog focused on a SRO panel that featured some of the heavy hitters in R & D. The relevant excerpt below. S.F. MusicTech Summit: How Do Listeners Want to Discover New Music? ….The standing-room-only “Recommendation & Discovery” panel offered one of the more interesting glimpses into the internal logic of the music industry machine. Chaired by Kevin Arnold of IODA (also creator of S.F.’s annual Noise Pop festival), the panel brought together some of the heavy hitters in the music search business, including MOG, Rovi Corporation, The Filter (a Peter Gabriel brainchild), and Slacker. An interesting discussion on the nuts-and-bolts of music recommendation and discovery services offered some contradictory food for thought. Music consumers looking for recommendations “prefer a man-to-machine to a man-to-man relationship” (David Hyman of MOG), and if you focus on personalized user specs, you get information that is increasingly “granular” (David Roberts of The Filter). Yet R & D is a “human-centric task,” said Adam Powers of Rovi. Powers also asserted that when Rovi, a giant in the R&D world, was looking at other companies to acquire, it found 250 that thought they had R&D nailed. But from the number of R&D company reps in attendance at the SF Music Tech Summit, it seems that either that news hasn’t gotten out, or nobody’s actually nailed it.